Circular saws are invaluable when you need to get some cuts done quick and for those cuts that aren’t best suited for the table saw. I think one of the most applicable uses for circular saws is when cutting studs down to length for framing. That’s when you need a reliable saw that is going to give you nice, clean cuts – and do it fast. In fine carpentry, the circular saw also has its place. The growth and popularity of Festool track saws has many woodworkers buying in. For the purposes of this post, we’re going to be going over our picks for the best circular saws on the market. For power, portability, and performance, sometimes a big clunky circular saw is too much for smaller products. This hand-held 5 amp alternative weighs only 5 pounds, and it will cut through 2×4’s just as easily as a bigger circular saw, and rip through plywood easily. If those are the primary tasks for your circular saw needs, then it might just be perfect. The slim grip offers a comfortable weight balance to keep your lines straight, and it has a bevel capacity of 45 degrees for ripping corner pieces, though you won’t be chamfering 2x4s with it. It’s easy to hold, and even easier to power through small jobs. 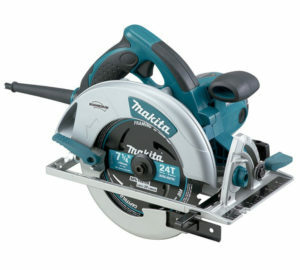 This is a great circular saw for the money. For a more traditional circular saw with advanced features, the 5280 from Skil will have you on track with laser guidance. The saw takes traditional 7-1/4 inch blades, so you can do just about any cutting job by choosing the right cutting steel. It bevels up to 51 degrees with a positive stop at 45 for precision work, and the laser light will keep you on target, without guessing where your saw is going to make the next cut. Add to that a 15 amp motor, while still keeping the weight under nine pounds, and you have a versatile cutting solution anywhere in reach of an extension cord. Wall power spins the motor up to 2.5 horsepower, giving you all you need to rip through even tougher materials. A torque clutch lessens the risk of kickback, and there’s a power indicator on top. It doesn’t come with an electric brake or a built-in light of any kind. However, it’s priced right and it’ll get the job done for most rough carpentry work. While not as lightweight as the Skil saw, this option from DeWALT is pretty light at under nine pounds, with a 15-amp motor, and a 57 degree maximum bevel with positive stops at both 45 and 22.5 degrees. It also comes with an integrated dust blower to keep all those annoying shavings off of your cutting line. The electric brake is a safety feature that many think should come standard, and on this saw, it does. The maximum speed without a load is 5200 RPMs, and the power output is almost 2 kW. It doesn’t come with a light or laser, but it does have its own carrying bag, and for a little extra you can buy a fence with it. The cord is also extra long, which is a nice finishing touch. DeWalt quality comes in at a slightly higher price point than most competitors, but in this case, it’s worth it. An interesting mix of power and portability, this cordless saw from Black & Decker uses a smaller 5-1/2 inch cutting blade, but still has enough depth of cut to power through almost any job it’s big brothers can do. It shares batteries with the 20V MAX system, so if you already have other tools with the same battery pack, this will fit in nicely. If not, it’s one of the few cordless power tools that is cost-effective enough to allow purchase of the battery pack. It also comes with a two year warranty. It’s also incredibly light, which means that working overhead won’t wear you out. No frills, it doesn’t include any fancy blowers or lights, but it’s still a tremendous value for the money, while being light and versatile. A great circular saw from a great brand, this powerhouse will deliver 5800 RPMs on a 15 amp fuse, and every part of it is built for durability, from the blade lock to the base plate, to the reinforced cord. It’s tough enough to keep up with any contractor, like a good employee should. The bottom plate has rulings to keep you on course, and it bevels up to 56 degrees with positive stops at 22.5 and 45. Two forward facing LEDs keep your work lit, even as the sun is going down. Magnesium components keep the strength up while keeping the weight down, and all of the gears are precision cut and heat treated. It also comes with a carbide tipped blade, wrench, rip fence, and a sturdy plastic case. The only real downside is the weight, which does tip the ten pound threshold, but not by much. Don’t let that keep you down, the price is very good right now and this is one heck of a circular saw.